"Alice in Wonderland" redirects here. For other uses, see Alice in Wonderland (disambiguation). 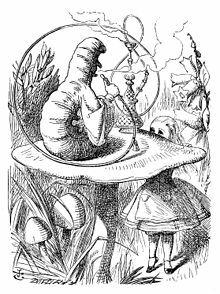 Alice's Adventures in Wonderland is a novel by Lewis Carroll (Charles Lutwidge Dodgson), published on 4 July 1865, three years after the first telling of the tale to the three Liddell sisters, Ina, Alice and Edith, and promising to write it down at the request of Alice. It is similar to his later novel, Through the Looking-Glass. 1.1 Chapter I. Down the Rabbit-Hole. 1.2 Chapter II. The Pool of Tears. 1.3 Chapter III. A Caucus-Race and a Long Tale. 1.4 Chapter IV. The Rabbit Sends in a Little Bill. 1.5 Chapter V. Advice from a Caterpillar. 1.6 Chapter VI. Pig and Pepper. 1.7 Chapter VII. A Mad Tea-Party. 1.8 Chapter VIII. The Queen's Croquet-Ground. 1.9 Chapter IX. The Mock Turtle's Story. 1.10 Chapter X. The Lobster Quadrille. 1.11 Chapter XI. Who Stole the Tarts? 1.12 Chapter XII. Alice's Evidence. Chapter I. Down the Rabbit-Hole. There was nothing so very remarkable in that; nor did Alice think it so very much out of the ordinary to hear the Rabbit say to itself 'Oh dear! Oh dear! I shall be late!' ...but when the Rabbit actually took a watch out its waistcoat pocket, and looked at it, and then hurried on, Alice started to her feet. After a fall such as this, I shall think nothing of tumbling downstairs! There seemed to be no use in waiting by the little door, so she went back to the table, half hoping she might find another key on it, or at any rate a book of rules for shutting people up like telescopes: this time she found a little bottle on it, ('which certainly was not here before,' said Alice,) and round the neck of the bottle was a paper label, with the words 'DRINK ME' beautifully printed on it in large letters. If you drink much from a bottle marked 'poison' it is almost certain to disagree with you, sooner or later. Chapter II. The Pool of Tears. Chapter III. A Caucus-Race and a Long Tale. Chapter IV. The Rabbit Sends in a Little Bill. Oh my ears and whiskers! Chapter V. Advice from a Caterpillar. Chapter VI. Pig and Pepper. The pepper when he pleases! 'I don't much care where —' said Alice. Chapter VII. A Mad Tea-Party. 'Come, we shall have some fun now!' thought Alice. 'I'm glad they've begun asking riddles. — I believe I can guess that,' she added aloud. 'Two days wrong!' sighed the Hatter. 'I told you butter wouldn’t suit the works!' he added looking angrily at the March Hare. You know you say that things are 'much of a muchness' — did you ever see a drawing of a muchness? Chapter VIII. The Queen's Croquet-Ground. They're dreadfully fond of beheading people here; the great wonder is, that there's any one left alive! Chapter IX. The Mock Turtle's Story. 'You ought to be ashamed of yourself for asking such a simple question,' added the Gryphon. Chapter X. The Lobster Quadrille. Explanations take such a dreadful time. You're nothing but a pack of cards! "The horror of that moment," the King went on, "I shall never, never forget!" "You will, though," the Queen said, "if you don't make a memorandum of it." It's the oldest rule in the book. Though written in contemporary idiomatic English, this has been recently cited on the Internet on various "quotations" websites (and elsewhere) as having being written by Lewis Carroll in Alice in Wonderland [sic]. 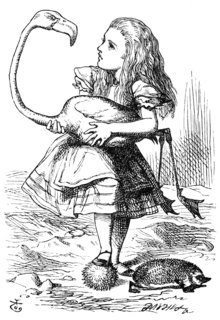 However, it does not appear within the text of Alice's Adventures in Wonderland or Through the Looking-Glass. It was actually a line spoken by a character named Jefferson in Once Upon a Time (TV series) in a 2012 episode entitled "Hat Trick," in which the literary character The Mad Hatter appears. – Ref: Internet Movie Database (IMDb), quotes from Once upon a Time, "Hat Trick". There are good books which are only for adults, because their comprehension presupposes adult experiences, but there are no good books which are only for children. A child who enjoys the Alice books will continue to enjoy them when he or she is grown up, though his "reading" of what they mean will probably change. 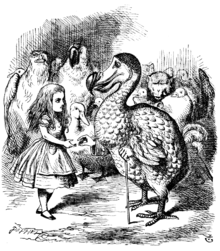 In his brief dialogue between the King and the Queen - two of the chess piece sovereigns of the Looking Glass House - Lewis Carroll captured the complementary sides of the coin we term memory The King, having experienced a "horrifying" event (being set on a table by Alice, a relative giant whom the King could neither see nor hear), expresses absolute faith in the durability of memory. The Queen, in contrast, presents a less flattering view of the capacity: that without some intervention (a memorandum), even a salient event will be forgotten. In a rare instance, the reality experienced by the King and Queen on their side of the looking glass is reflected on the drawing room side as well. Memory is at times seemingly and at other times frustratingly fallible. What is at times seemingly indelible and at other times frustratingly fallible. What is more, in true looking glass fashion, the same past experience can at one moment impinge on consciousness unbidden and at another elude deliberate attempts to recollect it. Bauer, Patricia J. (2007). Remembering the times of our lives: memory in infancy and beyond. Hillsdale, N.J: Lawrence Erlbaum Associates. ISBN 0-8058-5733-8. OCLC 62089961., p. 3. I can guarantee that the books have no religious teaching whatever in them - in fact they do not teach anything at all. No story in English literature has intrigued me more than Lewis Carroll’s Alice in Wonderland. It fascinated me the first time I read it as a schoolboy and as soon as I possibly could after I started making animated cartoons, I acquired the film rights to it. People in his period had no time to waste on triviality, yet Carroll with his nonsense and fantasy furnished a balance between seriousness and enjoyment which everybody needed then and still needs today. Lenny's Alice in Wonderland site contains background info, pictures, full texts, story origins, literary analyses, Disney's movie, and more. 'The Best Butter' Twitter stream has a random daily quote from Alice's Adventures in Wonderland. This page was last edited on 26 March 2019, at 00:46.